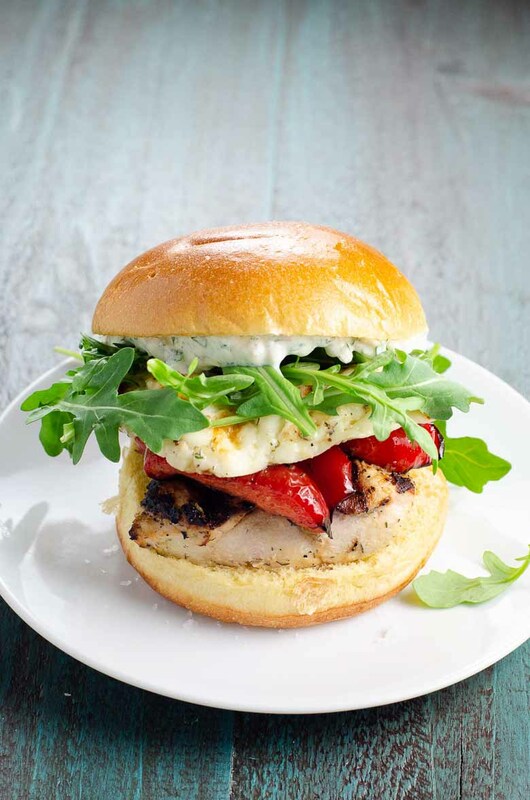 These grilled chicken sandwiches with halloumi, red bell peppers, arugula, and a really tasty, herby sauce are bursting with Greek-inspired flavors. You can marinate the chicken well in advance, even the day before if you like. After that, everything about these grilled chicken sandwiches comes together in a matter of minutes. Grilling should be nice and easy, don’t you think? Usually that’s because grilling is for relaxed, beautiful summer days — though recently in New Jersey we’ve been needing easy grilling recipes because it’s hard to dodge wind gusts and lightning bolts and hold an umbrella and grill something complicated all at the same time. Regardless of your motive, it’s great to be able to keep it simple while also keeping it interesting and delicious and not just all about the burgers and dogs. (Not that there’s anything wrong with that.) 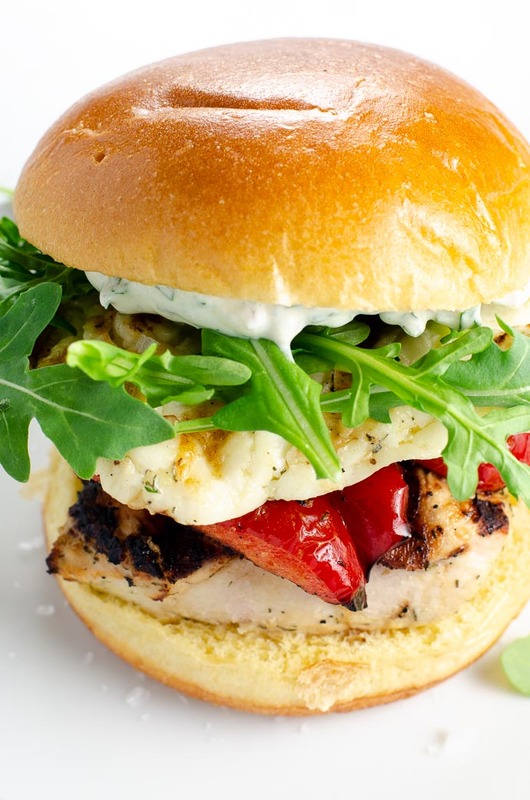 These grilled chicken sandwiches with halloumi cheese, red bell peppers, arugula, and a really tasty, herby sauce couldn’t be more accessible, but they’re also kinda special in a low-key way. Anything with a marinade AND a sauce has my heart, even if it makes the ingredient list look suspiciously long.You can marinate the chicken well in advance, even the day before if you like. After that, everything about these grilled chicken sandwiches comes together in a matter of minutes. You guys. Halloumi is a dream come true, that’s what it is — and there’s nothing quite like it. Halloumi cheese originates in Cyprus. It’s made from a combination of sheep’s milk and goat’s or sometimes cow’s milk. When grilled or sautéed, it gets crisp on the outside and tender and dreamy on the inside. The taste is briny and herb-flecked and satisfying. You can get it here, if not in your local market, and I’d really recommend doing so. But if worse comes to worst, feta would make a tasty substitute. Just don’t grill it. Thanks to our friends at NXT CHPTR, who reminded us how convenient halloumi can be for vegetarians in the summertime. (Traditionally prepared halloumi is a rennet-free, vegetarian cheese.) That tip got us thinking about a great vegetarian alternative to the chicken in this sandwich: portobello caps. Simply substitute one portobello cap per sandwich for the chicken breasts. For each cap, remove the stem and scrape out the gills with a teaspoon, then proceed with the recipe exactly as directed. No further changes needed! If you’re serving some meat-eaters and some vegetarians, just separate the marinade into two bags. These grilled chicken sandwiches with halloumi are bursting with Greek-Inspired flavors. You can grill everything or cook indoors in a hot cast iron pan or grill pan. Don't be deterred by the longish ingredient list — there's nothing complicated about putting this meal together. If you can't get your hands on halloumi, feta would make a good substitute, but don't grill it. Just lay a slice onto each sandwich when assembling. 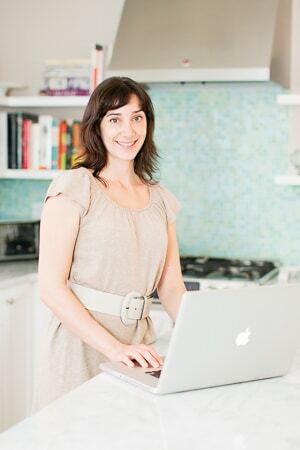 In a small bowl, whisk together the marinade ingredients: olive oil, lemon juice, garlic, salt, dill, oregano and pepper. Cut each chicken breast in half across the middle and pound with a mallet if necessary to make each piece about an inch thick and a little bigger than a hamburger bun. Place chicken pieces into a gallon-size zip-top bag. Pour marinade into zip-top bag and seal bag. Work the marinade into the chicken a little bit with your hands, then place bag on a plate and refrigerate for at least two hours. Cut bell peppers in half from stem end to tip and remove stems, ribs and seeds. Cut a slit of about an inch at both the top and bottom of each pepper half to help it relax into a flatter shape as it grills. Cut halloumi into four slices, not super-thin or they might get too floppy on the grill. Prepare grill for direct heat (or preheat gas grill to medium-high). Arrange chicken on grill with some marinade still clinging to it. Dredge pepper pieces through marinade and place on grill. Grill for 5 minutes on the first side, then flip everything and grill chicken about 3 to 4 minutes more, until just cooked through. Set chicken on a plate. If peppers are soft enough for your liking, remove them too, otherwise leave them on while you grill the halloumi. Dredge halloumi through marinade and place on grill. Cook 2 to 3 minutes on first side, until chewy and lightly grill-marked. Flip and cook one minute more. In a small bowl, stir together the sauce ingredients: sour cream, olive oil, lemon juice, shallot, parsley, dill, tarragon, salt, and pepper. 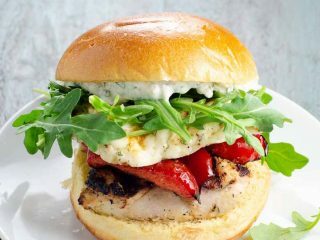 Assemble each sandwich by layering chicken, pepper, halloumi and arugula onto each bottom bun and spreading some sauce onto each top bun.